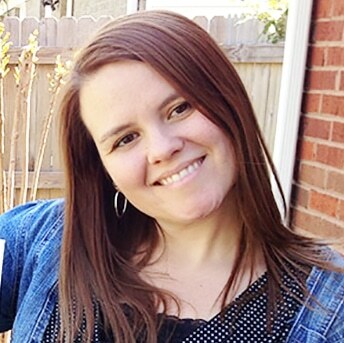 This post is sponsored by Bistro Favorites, but the content and opinions expressed here are my own. 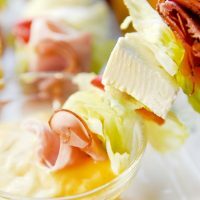 Salad Skewers are a delicious option for a low carb/keto diet. They also make a great sandwich replacement and are fun to dip into a yummy dressing! Salad skewers are a great appetizer for parties. We also love to make these for a lunchtime meal or picnic idea. Lunchtime is actually one of my favorite meals of day. I’ve always loved having salads, sandwiches and soups for lunch. It’s important to me to keep things light so I don’t get too sleepy like I always do after a big meal. That’s why I love Salad Skewers. It’s a little bit sandwich and a little bit salad stacked up in an hand held meal! These are a great low carb and gluten free option too. These are so good and the options are as endless because you can pretty much use most salad/sandwich items. Greek Salad Skewers: Try a mix of olives, feta, onions, lettuce and sliced beef. For the dipping sauce use a Greek or basic vinaigrettes. 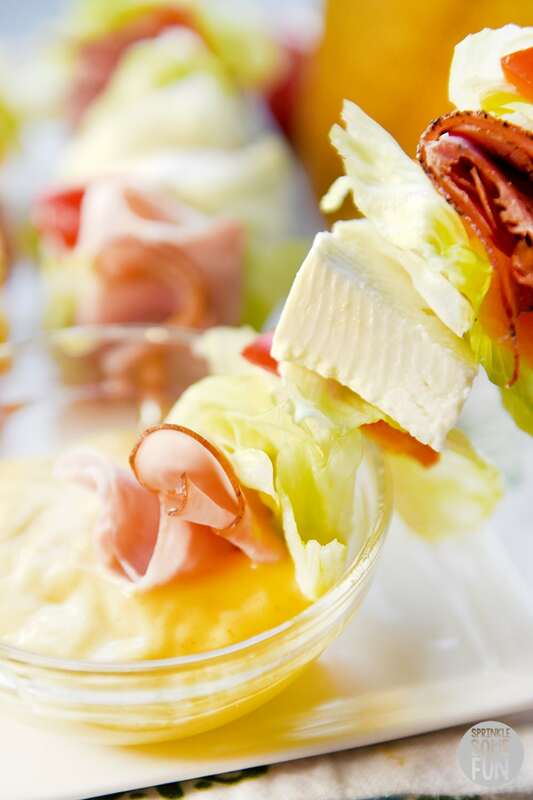 Cobb Salad Skewers: A good mix would be egg, bacon, ham, lettuce, and cheddar cheese. Use ranch or your favorite dressing for a dip. Caprese Salad Skewers: Fresh mozzarella, basil and tomatoes (maybe some Italian bread for the skewer too). Drizzle with olive oil and balsamic vinegar.Chicken Caesar Salad Skewers: Grilled chicken, lettuce, large croutons and parmesan cheese. Of course you’ll want some Caesar dressing to dip these into. Fruit Salad Skewers: Use a mix of your favorite fruits like grapes, apples, oranges and strawberries. Make a sweet fruit dip to go with them too. 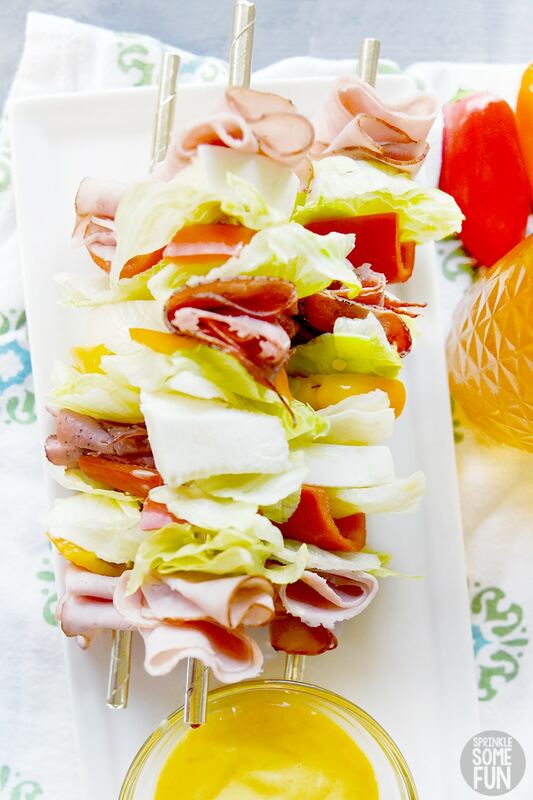 One of my favorite salad skewer ideas is to just use whatever fresh veggies, cheeses and meats I have. For these I used Bistro Favorites 100% Natural sliced meats. These meats are so tasty and great for using on sandwiches, flatbreads and in salads too. 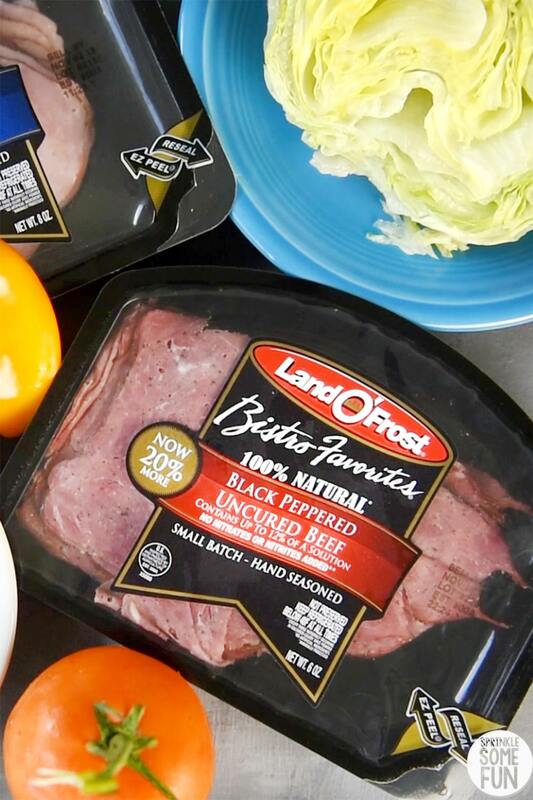 Bistro Favorites 100% Natural sliced meats are high-quality cuts are made in small batch, hand-rubbed with spices and seasonings, and freshly hand-carved. Bistro Favorites are all natural, with minimal processing and no artificial ingredients. I used two of the varieties of the sliced meats: the Bistro Favorites 100% Natural Uncured Black Forest Ham and the Bistro Favorites 100% Uncured Peppered Uncured Beef. They are so good that I am going to go back and purchase the Bistro Favorites 100% Natural Rotisserie Seasoned Turkey Breast next time. 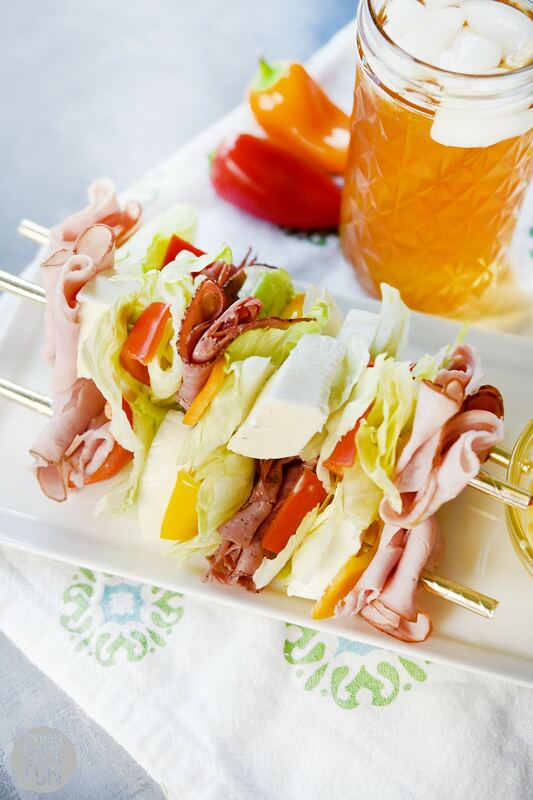 I used gold foil covered paper straws as “skewers” for my salad on a stick and they worked out fine. Metal skewers might be a bit too slippery for the veggies and so I would stick to wood. 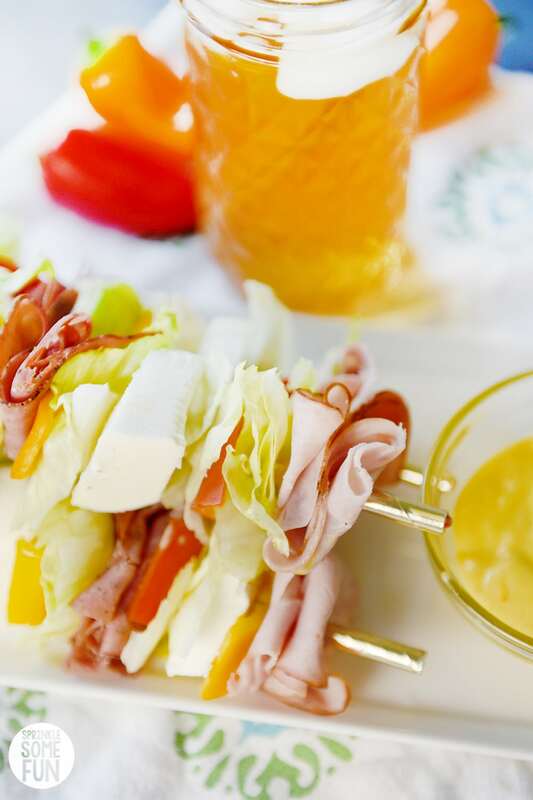 Salad skewers are simple, but still feel gourmet! We like to serve these at parties because they are easy for everyone to grab and put on their plates quickly. I also like them for a low carb or gluten free sandwich/salad option on the go. I love to make my salads this way because it makes them seem a bit fancier. Plus, I love to have a few dips to choose from. I have to admit that dipping sauces just make everything taste great. 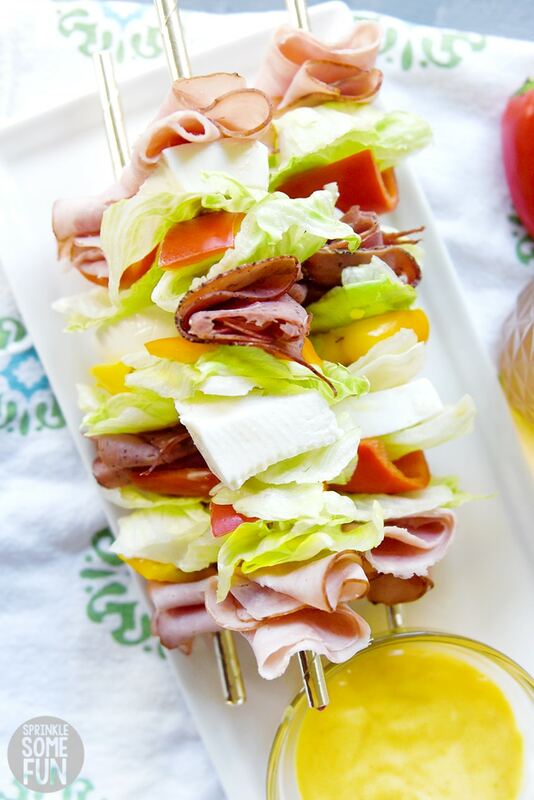 The tasty sliced meats and cheeses in these salad skewers are great on their own too for those looking for a healthy option. Stay away from soft bread. Soft breads will soak up too much of the juices from the veggies and get too soggy. Use breads like a baguette or a semi-toasted crouton. Be careful with softer fruits and veggies. You may need to do some trial and error with softer fruits and veggies like bananas and avocados. They should be fine, but may not hold up well over time so make and eat these right away. 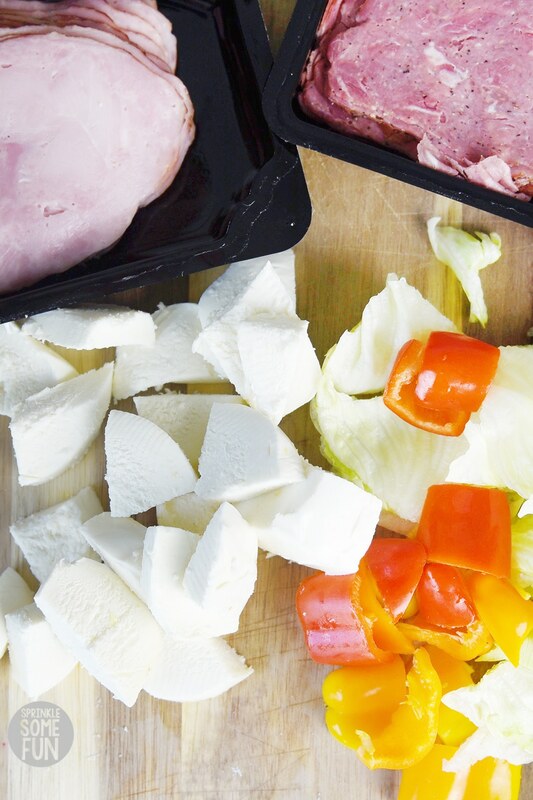 Cut ingredients into larger pieces. You’ll notice in my recipe below that I mention using chunks. This is because you’ll need more surface space for whatever you want to put on your skewer. The meats are fine to fold over and place on the skewers, but things like cheese should be cut into chunks (especially the soft mozzarella). Get creative with sauces. One of my favorite things about salad on a stick is the sauces! Try a barbecue sauce or honey mustard. There is no need to stick with traditional dressings for these if you want to try something new. 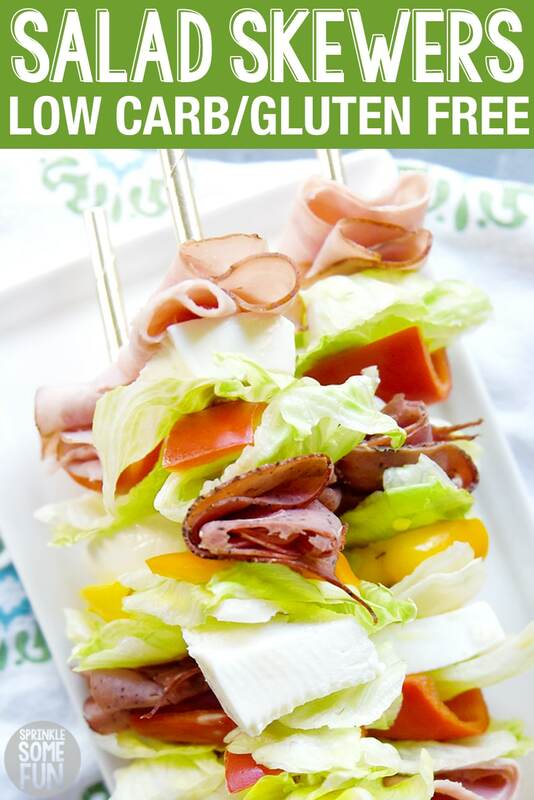 If you love this easy recipe for Salad Skewers then please give us a 5 star review below! Salad Skewers are a great option for a low carb/keto diet. They also make a great sandwich replacement and are easy to dip into a yummy dressing! Salad skewers are a great appetizer for parties. We also love to make these for an easy lunchtime meal or picnic idea. It's up to you what order of ingredients you want on the skewers, but I suggest using lettuce in between each item. Start at one end and press down each item firmly onto the skewer until it just breaks through the surface. Gently pull the ingredients down onto the stick/skewers until they are full of the salad ingredients. Serve with dipping sauce in a cup and dunk your Salad Skewers into the cup! Enjoy! These are great for a party as an appetizer or for an easy picnic idea.